This is so true of painting your home – rushing things or cutting corners is really going to cost you in the long run. The usual result of no preparation is a sloppy finish that winds up having to be done redone. How much work the exterior house painters have ahead of them is down to the condition of the house itself – it will vary from one job to the next. There are plenty of power tools out there to help exterior house painters with preparing the outside of the house for painting, but when it comes down to it, you’re going to wind up using good old manual labor to get the job done. All that scraping and tearing and sanding will be worth it in the end. The sweat that exterior house painters put into preparing the house will give you a result that’s well worth it. Peeling paint and mildew (mold caused by dampness) are the main things exterior house painters need to look out for when prepping the outside of the home. Any peeling paint will be required to be removed. Any mildew spots will need to be cleaned and then the surface underneath treated to stop the problem coming back. If they do not take care of the mildew, it’s promised to bubble up underneath the already painted part of the walls and ruin all your hard work. If there is an aluminum siding on your house, then all they will need to do is give it a good clean and maybe sand down any rough spots. Once the reliable house painters have scraped away the worst of the damage (if there is any) then it’s time to sand the surface. But before they start sanding anything they are best served to wash the walls down first. They can use a pressure washer to do this, but they need to be careful because some of them are powerful enough actually to cause damage to wooden surfaces. Usually using a garden hose is enough for the cleaning job. 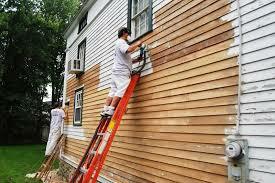 Exterior house painters should always make sure the surfaces are completely dry before they begin sanding. How long will it take for them to dry? It depends on the time of year and hours of sunlight per day. If they want to be entirely sure, then they have to use a moisture meter to measure how wet the wooden surfaces still are. The areas exterior house painters need to pay most attention to with their sanding tools are any spots that had peeling paint or mildew. These are the spots that could ruin the final finish so they should make sure they’re sanded and appropriately treated before they move ahead with their painting plans. Your professional house painters should make sure they clean off any dust left behind after sanding – otherwise, they’ll wind up with it mixed into the paint. Foothills provides a variety of painting services for residents and businesses. For more information contact us at https://foothillspaintinggreeley.com or visit us at Greeley painters.